This weekend we observe Easter. The dark days are over. Spring is here. Jesus offers hope. Throw in a fertile rabbit and some promising new eggs. Dip everything in chocolate. We can begin again. We can forgive. The phoenix rises from the ashes and so too, can we. If someone was to make an S.O.S. call to humanity, Easter should theoretically be the perfect time to do it - when everyone gets a second chance at being a decent human being. Well, we’ve received that call. DO YOU HEAR US? ARE YOU WITH US? 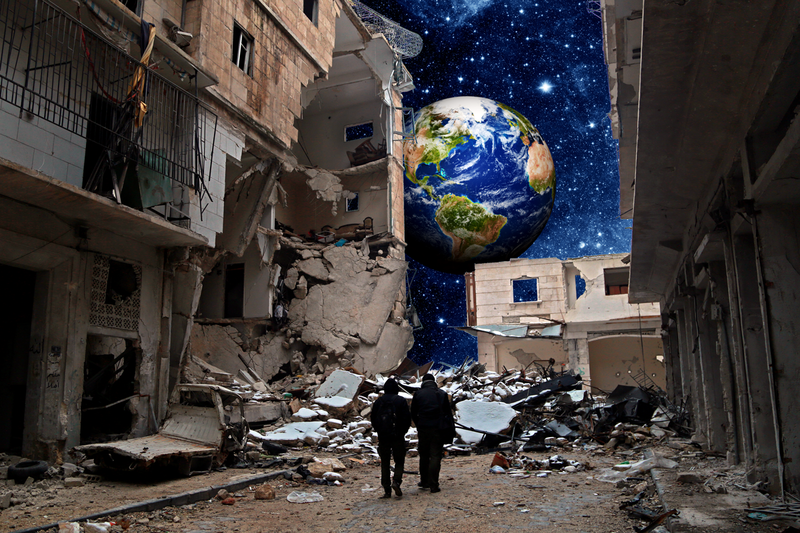 Though not technically another planet, “Planet Syria” is tongue-in-cheek, taking its name from the isolation the nation has received from the international community, as their basic human rights have been ignored, and their struggles for peace and freedom have gone unrecognized. Planet Syria have named April 7th as a day for the world to show their support and answer their S.O.S for peace: “We hear you loud and clear!" It doesn’t take a huge stretch of the imagination to be reminded of the world’s indifferent reaction during the Rwandan genocide… so perhaps it’s no coincidence that April 7th is also the day nominated by the United Nations as “the International Day of Reflection on the Genocide in Rwanda”. However this April 7th is not about looking back - this April 7th is about moving forward and creating a better future. It's about stating (to quote Bernard Black) "Up with this, I will not put!" The focus of Syria’s April 7th, “Is anybody out there?” campaign, is to engage people around the world in solidarity to stop the violence and extremism. Seems fair enough to me. One of their primary goals: "An end to the Assad regime’s barrel bombs and air strikes." (Still seems like a reasonable request). “Barrel bombs” are dirty old oil barrels that have been filled with explosive crap - gunpowder, shrapnel, toxic substances, chlorine gas – anything designed to take you out as violently as possible. These “barrel o’ deaths” are then rolled out of government helicopters and planes, to target civilians in hospitals, schools and homes. The United Nations, bless their cotton-socks, were/are aware that 'barrel bombs' were/are being used against the Syrian people by their own government - the UN Security Council unanimously banned barrel bombs a year ago (only one year ago? It’s been a four-year war and counting…just saying…) yet this ban has failed to stop the Assadi Regime from doing whatever the hell they want. Even Mother Theresa said “If I look at the mass I will never act. If I look at the one, I will.” Even the most deeply compassionate of us understand how hard it can be to act when faced with something that seems to be so overwhelming. (Some of us have enough trouble just being the one who takes action to change the roll of toilet paper once it's run out). We are all, quite comfortably numb. But Planet Syria is not asking for a lot. Just to tell your fellow humans in Syria that you’re there. And April 7th has been chosen as the day to send messages of support, from around the world, to show Syria that it’s not alone. You can write something, you can mime something, you can sing something, you can paint something, you can say something - but most importantly, tell us you’re out there. The metaphor of Easter is that we can transform our lives and overthrow the power of darkness. If you can shake yourself from your Easter-chocolate-induced-diabetic-coma, then…. Send a signal!